This resort features condominiums designed with refinement and distinction. Accommodations are exquisitely accented with warm Indonesian woods and cool Peruvian travertine. Superbly appointed kitchens feature Sub Zero refrigerators and sleek granite countertops. The heated soft-water river pool meanders over two acres with flumed water slides and three sand bottom whirlpool spas. Includes complimentary in room Internet access and daily parking. 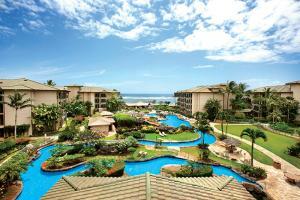 Located on Kauai's north eastern coast in Waipouli, 8 miles north of the Lihue airport. Pool Bar serving poolside snacks, sandwiches and beverages at the Outrigger Waipouli Beach. Full service dining and food markets nearby. Steps to Kauai Village shops and restaurants. One mile to Coconut MarketPlace shops, restaurants, Cinema Complex. Golf nearby at the Wailua Golf Course or at the Princeville Resort Golf about 20 minutes away.